It is not too late to sign up for the AMC Cold River Camp Trail Crew. Sign up today! 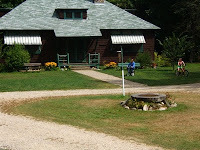 AMC Cold River Camp offers unique hiking opportunities in the eastern White Mountains with steep mountain climbs leading to scenic wooded areas and open ridge walks. Your experienced AMC trail crew leaders will provide training and supervision for your volunteer crew throughout the week. This program is open to all over the age of 18 and first time trail workers are welcome. We will head out from AMC Cold River Camp each day to our project in the Royce-Baldface region. Work locations may involve up to a two-mile hike in from the trailhead. The crews will work four days during the week, (Monday, Tuesday, Thursday, and Friday) averaging 6-8 hours/day in the field, with Wednesday free for enjoying the area. Projects may include clearing drainage ditches, brushing back vegetation, hardening trails with gravel, constructing bog bridges, or building rock stairs or drainage structures. While based out of AMC Cold River Camp, the crew stays in cabins. All cabins have beds with mattresses and a nightstand. There are blankets and pillows available, but be sure to bring a sleeping bag as well to be extra toasty. There is a library, dining room and kitchen, and main bathhouse with showers and bathroom facilities. The crew and leaders will help prepare delicious meals each day. There will be plenty of food to satisfy the trail worker appetite. After dinner the crew can relax, sit by the fire and read, or take an evening stroll. 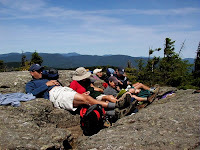 This is a great way to experience the Royce-Baldface region of the White Mountains while providing a valuable service to the National Forest as well.